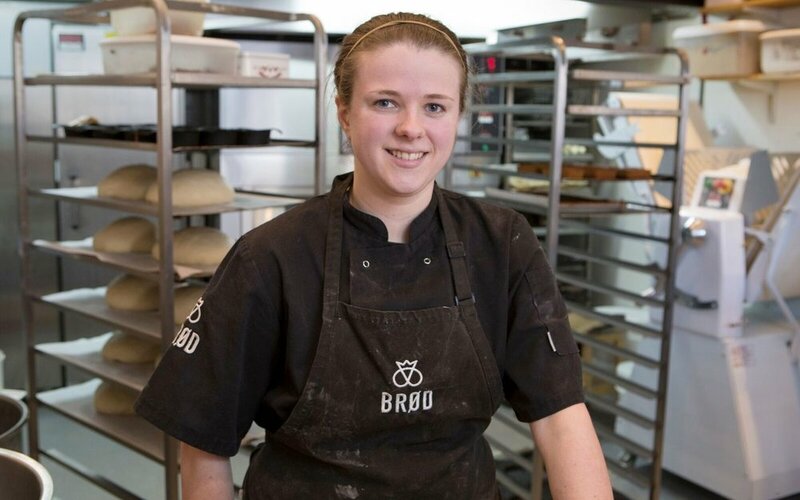 Our apprentice baker, Becky, has just returned from a ten day visit to Copenhagen to hone her skills at two of the city's bakeries. We caught up with her, after her jam-packed trip. "I was definitely a little nervous, but mostly excited because we had been planning this trip for so long. I was just really looking forward to finally getting out there and into the bakeries". "I spent two days working with the owner, Rene. His technical knowledge of all baking aspects was amazing and I learned so much from him. I was introduced to quite a few new products too, including the ‘Wales Kringle’, flødeboller and honey hearts". focused on bread, learned several new recipes as well as some new tips about flødeboller using a different method and flavours. I was also introduced to several new pastry types and different folding techniques". "There were one or two language barriers, which made a few of the more technical points difficult to take in, but we got by fairly well with the help of some dodgy sign language! It was quite intense as there was so much I wanted to get through in quite a short space of time". Den lille Havfrue - The Little Mermaid. “A real highlight was how friendly and generous everyone I worked with was - explaining techniques, putting up with my almost constant questions and making me feel really welcome! The night I arrived, Rene and Dorthe from Bageriet Diget and Berit and Steen from Det Helt Rigtige Bager all took me out for a lovely meal, which was a great start to the visit. I was also really lucky to meet the wonderful Julie, a konditor (patisserie) apprentice at Det Helt Rigtige Bager who took me around Copenhagen to see the sights. I also experienced the Danish art of hygge with an evening of traditional Danish food and beer with her family, so I definitely got a taste of some real Danish culture as well as training in the bakeries". "There are a lot of new ideas in the pipeline, and we're currently perfecting our bespoke version of flødeboller. There are one or two new bread recipes in development, including a chilli baguette, which takes 24 hours to make from start to finish and tastes amazing. authentically Danish. Look out for some new variations on rye bread too!